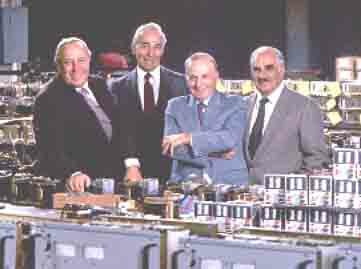 Kepco was founded in 1946 by four brothers, Jack, Jesse, Max and Ken Kupferberg. The company grew out of the involvement of three of the four founders in one of World War II's "Big Science" projects -- the Manhattan Project. Much of the work they did at Los Alamos remains classified to this day. The work they were involved with required them to help invent and build new electronic instruments. They had to build their own instruments because there really was no electronics business and no commercially available electronic instruments at that time. Indeed, the word "electronic" had not yet been coined. The brothers believed that the demand for electrical measuring devices and generators was going to grow rapidly and that there was opportunity in helping provide foundation pieces to this new industry. Given their academic backgrounds (Ken and Max being physicists), they thought that providing teaching aids to help train students in the field of electronics was a great opportunity. They developed a board and overlays for different circuit experiments designed to teach vacuum tube circuits to college-level students. They also designed and built a power supply (Model 103) to run the experiments. The response was good but unexpected: "We like your experiments but we really want to buy the power supply." Then, as now, Kepco listened to its customers. Thus, Kepco became an instrument manufacturer specializing in regulated power supplies. The brothers' philosophy was to design and build instruments as if they were for their own labs. During the war, their lives, those of their colleagues, and the success of their mission had depended upon the quality, reliability and functionality of the instruments they developed. They believed that their customers wanted products that met these same standards. Today, this attitude continues to drive the business. These and other developments have helped create and define the commercial merchant power supply industry. Kepco, Inc., is headquartered in New York City, maintaining manufacturing, distribution, and research and development facilities at this site. Learn more about about Kepco from this feature by Made in NYC, an organization dedicated to supporting a vibrant manufacturing sector in New York City. Today, Kepco remains a privately held business. Three sons of the founders are responsible for its day to day management.